CAPE CANAVERAL, Fla. (AP) — Vice President Mike Pence missed seeing a SpaceX rocket soar Tuesday. 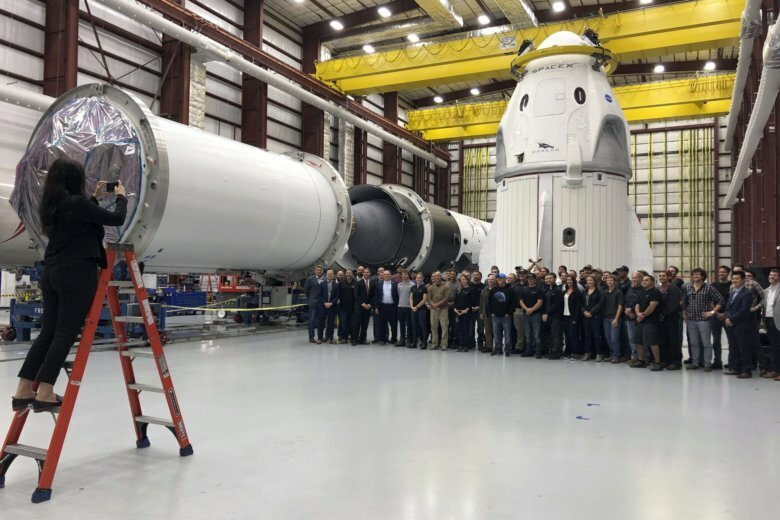 But he still got to view the company’s new crew capsule, designed to carry astronauts to the International Space Station as soon as next year. Pence joined members of the Air Force to witness the launch of the most powerful GPS satellite ever built, but a last-minute abort kept the Falcon rocket grounded. SpaceX will try again Wednesday. Pence later toured a SpaceX hangar and admired the sleek, white Dragon capsule being readied for a January test flight, minus a crew. The next capsule, still in California, will carry astronauts. More than 100 SpaceX workers crowded around Pence to shake his hand. The vice president joined in group photos, with the Dragon as a backdrop. Alongside the capsule was a brand new Falcon booster that will send it into space, as well as a less glamorous recycled booster that’s already launched twice.